ESP8266 Temperature Sender and Plotter. TV Sound Amplifier with IR remote learning function. Mini Project: USB Power Adapter for a DashCam. Remote Network swicher for commercial VGA-to-AV Converter. Build A Variable DC Bench Power Supply. Build A PICAXE Weather Station. A PICAXE Microcontroller High Quality Video Switchbox. Starting Electronics - a simple first project. How to build a Video Switchbox. An 8-input 'Solid State' Video Switchbox. A very brief history of Radio. Follow this guide to help track down TVI. Interactive Great Circle Maps of the World. Check out my collection of calculators, ready-reckoners, etc. A small selection of software to download. 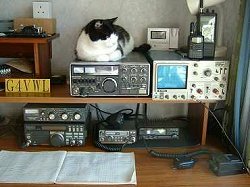 Hamauction.org.uk is a site to allow hams to sell unwanted equipment free of charge - no selling fees & no listing fees. Superb collection of electronic component datasheets. Tuesdays at Grappenhall Community Centre, Warrington. Alt Tuesdays at Scout Hut, Castle Road, Runcorn. Meetings 7:30pm 1st & 3rd Tuesdays each month. Liverpool & District AR & E C.
Wednesdays at the RoyaL British Legion Club, Rose Lane, Mossley Hill, Liverpool 18. 2nd & 4th Wednesdays at Irby Cricket Club, Mill Hill Road, Wirral.